^ ICZN (2000). “Opinion 1949. Cacatua Vieillot, 1817 and Cacatuinae Gray, 1840 (Aves, Psittaciformes): conserved.”. Bulletin of Zoological Nomenclature: 66-67. http://biodiversitylibrary.org/item/45022#80. ^ Suppressed by the en:International Commission on Zoological Nomenclature in Opinion 1949 (2000). ICZN (2000). “Opinion 1949. Cacatua Vieillot, 1817 and Cacatuinae Gray, 1840 (Aves, Psittaciformes): conserved.”. Bulletin of Zoological Nomenclature: 66-67. http://biodiversitylibrary.org/item/45022#80. ^ J. Simpson, E. Weiner (eds), ed (1989). “cockatoo”. Oxford English Dictionary (2nd ed.). Oxford: Clarendon Press. ISBN 0198611862. ^ Mynott, Jeremy (2009). Birdscapes: Birds in Our Imagination and Experience. Princeton, New Jersey: Princeton University Press. p. 319. ISBN 0691135398. ^ Higgins, Peter Jeffrey (ed.) (1999). en:Handbook of Australian, New Zealand and Antarctic Birds. Volume 4: Parrots to Dollarbird. Melbourne: Oxford University Press. p. 127. ISBN 0-19-553071-3. ^ a b c d e f g h i j k l Rowley, Ian (1997). “Family Cacatuidae (Cockatoos)”. In Josep, del Hoyo; Andrew, Elliott; Jordi, Sargatal. en:Handbook of the Birds of the World. Volume 4, Sandgrouse to Cuckoos. Barcelona: Lynx Edicions. pp. 246-69. ISBN 84-87334-22-9. ^ a b c Wright TF, Schirtzinger EE, Matsumoto T, et al. (October 2008). “A multilocus molecular phylogeny of the parrots (Psittaciformes): support for a Gondwanan origin during the cretaceous”. Molecular Biology and Evolution 25 (10): 2141-56. doi:10.1093/molbev/msn160. PMC: 2727385. PMID 18653733. https://www.ncbi.nlm.nih.gov/pmc/articles/PMC2727385/. ^ a b c de Kloet, RS; de Kloet SR (2005). “The evolution of the spindlin gene in birds: Sequence analysis of an intron of the spindlin W and Z gene reveals four major divisions of the Psittaciformes”. Molecular Phylogenetics and Evolution 36 (3): 706-21. doi:10.1016/j.ympev.2005.03.013. PMID 16099384. ^ a b Tokita M, Kiyoshi T, Armstrong KN (2007). “Evolution of craniofacial novelty in parrots through developmental modularity and heterochrony”. Evolution & Development 9 (6): 590-601. doi:10.1111/j.1525-142X.2007.00199.x. PMID 17976055. ^ Gray, George Robert (1840). A List of the Genera of Birds, with an indication of the typical species of each genus. London: R. & J.E. Taylor. p. 53. http://www.biodiversitylibrary.org/page/13668970 2009年11月2日閲覧。. ^ Christidis and Boles, p. 148. ^ Astuti, Dwi; Azuma, Noriko; Suzuki, Hitoshi; Higashi, Seigo (2006). “Phylogenetic Relationships Within Parrots (Psittacidae) Inferred from Mitochondrial Cytochrome-bGene Sequences”. Zoological Science 23: 191. doi:10.2108/zsj.23.191. ^ a b Christidis L; Schodde R, Shaw DD, Maynes SF (1991). “Relationships among the Australo-Papuan parrots, lorikeets, and cockatoos (Aves, Psittaciformes) - protein evidence”. Condor 93 (2): 302-17. doi:10.2307/1368946. http://elibrary.unm.edu/sora/Condor/files/issues/v093n02/p0302-p0317.pdf. ^ Schweizer M, Seehausen O, Güntert M, Hertwig ST (March 2010). “The evolutionary diversification of parrots supports a taxon pulse model with multiple trans-oceanic dispersal events and local radiations”. Molecular Phylogenetics and Evolution 54 (3): 984-994. doi:10.1016/j.ympev.2009.08.021. PMID 19699808. ^ Christidis and Boles, p. 200. ^ a b Courtney, J (1996). 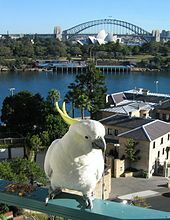 “The juvenile food-begging calls, food-swallowing vocalisation and begging postures in Australian Cockatoos”. Australian Bird Watcher 16: 236-49. ISSN 0045-0316. ^ a b c Brown DM, Toft CA (1999). “Molecular systematics and biogeography of the cockatoos (Psittaciformes: Cacatuidae)”. Auk 116 (1): 141-57. ISSN 0004-8038. ^ Schodde, R; Mason IJ (1997). “Aves (Columbidae to Coraciidae)”. In Houston WWK, Wells A. Zoological Catalogue of Australia. 37.2. Melbourne, Victoria: CSIRO Publishing. ISBN 0-643-06456-7. ^ a b c Astuti, D (2004). A phylogeny of cockatoos (Aves: Psittaciformes) inferred from DNA sequences of the seventh intron of nuclear β-fibrinogen gene.. Graduate School of Environmental Earth Science, Hokkaido University, Japan. http://www.ees.hokudai.ac.jp/coe21/J/study/17RA/dwi.pdf. ^ Adams M, Baverstock PR, Saunders DA, Schodde R, Smith GT, M; Baverstock, PR; Saunders, DA; Schodde, R; Smith, GT (1984). “Biochemical systematics of the Australian cockatoos (Psittaciformes: Cacatuinae)”. Australian Journal of Zoology volume=32 (3): 363-77. doi:10.1071/ZO9840363. ^ a b Christidis and Boles, p. 151. ^ Forshaw (1978), p. 124. ^ Christidis and Boles, p. 150. ^ Boles, Walter E (1993). “A new cockatoo (Psittaciformes: Cacatuidae) from the Tertiary of Riversleigh, northwestern Queensland, and an evaluation of rostral characters in the systematics of parrots”. Ibis 135 (1): 8-18. doi:10.1111/j.1474-919X.1993.tb02804.x. ^ Waterhouse, DM (2006). “Parrots in a nutshell: The fossil record of Psittaciformes (Aves)”. Historical Biology 18 (2): 223-34. doi:10.1080/08912960600641224. ^ a b Steadman, D (2006). Extinction and Biogeography in Tropical Pacific Birds. Chicago: University of Chicago Press. p. 348. ISBN 9780226771427. ^ Steadman, D; White P, Allen J (1999). “Prehistoric birds from New Ireland, Papua New Guinea: Extinctions on a large Melanesian island”. Proceedings of the National Academy of Science 96 (5): 2563-68. doi:10.1073/pnas.96.5.2563. http://www.pnas.org/content/96/5/2563.full.pdf+html 2009年12月4日閲覧。. ^ a b Forshaw (2006), plate 1. ^ Roselaar CS, Michels JP (2004). “Systematic notes on Asian birds. 48. Nomenclatural chaos untangled, resulting in the naming of the formally undescribed Cacatua species from the Tanimbar Islands, Indonesia (Psittaciformes: Cacatuidae)”. Zoologische Verhandelingen 350: 183–96. http://www.repository.naturalis.nl/document/43942 2009年12月5日閲覧。. ^ a b c Forshaw (2006), plate 6. ^ a b c d Cameron 2007, p. 1. ^ a b c Forshaw (1978), p. 110. ^ Cameron 2007, p. 69. ^ a b Cameron 2007, p. 67. ^ a b Cameron 2007, p. 61. ^ a b Cameron 2007, p. 59. ^ a b Cameron 2007, p. 68. ^ a b c Murphy S, Legge S, Heinsohn R (2003). 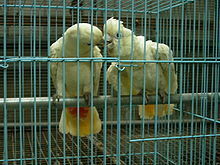 “The breeding biology of palm cockatoos (Probosciger aterrimus): a case of a slow life history”. Journal of Zoology 261: 327-39. doi:10.1017/S0952836903004175. ^ Cameron 2007, p. 3. ^ Cameron 2007, p. 71. ^ a b Cameron 2007, pp. 103-4. ^ Cameron 2007, p. 77. ^ Cameron 2007, p. 104. ^ Cameron 2007, p. 126. ^ Lindenmayer, DB; Pope MP, Cunningham RB, Donnelly CF, Nix HA (1996). “Roosting of the Sulphur-Crested Cockatoo Cacatua galerita”. Emu 96 (3): 209-12. doi:10.1071/MU9960209. ^ Cameron 2007, pp. 118-9. ^ Cameron 2007, p. 113. ^ Cameron 2007, pp. 116-7. ^ a b Cameron 2007, p. 114. ^ Crowley, GM; Garnett S (2001). “Food value and tree selection by Glossy Black-Cockatoos Calyptorhynchus lathami”. Austral Ecology 26 (1): 116-26. doi:10.1046/j.1442-9993.2001.01093.x. ^ Cameron 2007, p. 122-23. ^ Cameron 2007, pp. 143-44. ^ Saunders, DA (1974). “The function of displays in the breeding of the White-tailed Black Cockatoo”. Emu 74 (1): 43-46. doi:10.1071/MU974043. ^ Cameron, M (2006). “Nesting habitat of the glossy black-cockatoo in central New South Wales”. Biological Conservation 127 (4): 402-10. doi:10.1016/j.biocon.2005.08.019. ^ Heinsohn, R; Murphy S, Legge S. “Overlap and competition for nest holes among eclectus parrots, palm cockatoos and sulphur-crested cockatoos”. Australian Journal of Zoology 51 (1): 81-94. doi:10.1071/ZO02003. ^ Cameron 2007, p. 131. ^ Cameron 2007, p. 137. ^ Cameron 2007, p. 147. ^ Cameron 2007, pp. 139-40. ^ Cameron 2007, p. 141. ^ Cameron 2007, p. 143. ^ a b Forshaw (1978), p. 29. ^ Wood GA (1987). “Further field observations of the Palm Cockatoo Probsciger aterrimus in the Cape York Peninsula,Queensland”. Corella 12 (2): 48-52. http://www.aainsects.com.au/Pdf-papers-aainsects/Bird/bird-Cacat-3.pdf 2009年12月17日閲覧。. ^ Cameron 2007, p. 149. 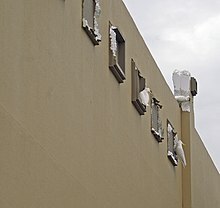 ^ Cordon, GP; Hitos Prados A, Romero D, Sánchez Moreno M, Pontes A, Osuna A, Rosales MJ (2009). “Intestinal and haematic parasitism in the birds of the Almunecar (Granada, Spain) ornithological garden”. Veterinary Parasitology 165 (3-4): 361-66. doi:10.1016/j.vetpar.2009.07.027. http://linkinghub.elsevier.com/retrieve/pii/S0304401709004257. ^ Cameron 2007, p. 153. ^ B, Mary; Sinclair R (2002). “Australian research on bird pests: impact, management and future directions”. Emu 102 (1): 29-45. doi:10.1071/MU01028. ^ a b Cameron 2007, p. 155. ^ a b Cameron 2007, p. 156. ^ Cameron 2007, p. 160. ^ Environment and Natural Resources Committee (Parliament of Victoria) (1995). 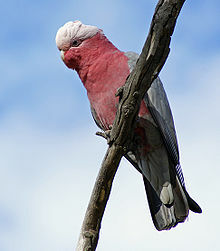 Problems in Victoria caused by Long-billed Corellas, Sulphur-crested Cockatoos and Galahs. Victorian Government Printer. ^ Maron, M (2005). “Agricultural change and paddock tree loss: Implications for an endangered subspecies of Red-tailed Black-Cockatoo”. Ecological Management & Restoration 6 (3): 206-11. doi:10.1111/j.1442-8903.2005.00238.x. ^ Kinnaird, M; O'Brien TG, Lambert FR, Purmias D (2003). 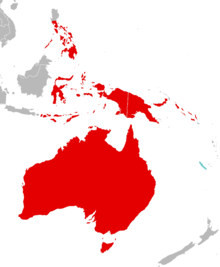 “Density and distribution of the endemic Seram cockatoo Cacatua moluccensis in relation to land use patterns”. Biological Conservation 109 (2): 227-35. doi:10.1016/S0006-3207(02)00150-7. ^ a b Cameron 2007, p. 164. ^ Cameron 2007, p. 166. ^ Cameron 2007, p. 169. ^ Forshaw (2006), plate 4. ^ a b c Low, p. 16. ^ Alderton, David (2003). The Ultimate Encyclopedia of Caged and Aviary Birds. London, England: Hermes House. p. 205. ISBN 184309164X. ^ King CE, Heinhuis H, Brouwer K (2007-12-18). “Management and husbandry of black cockatoos Calyptorhynchus spp in captivity”. International Zoo Yearbook 37 (1): 87-116. doi:10.1111/j.1748-1090.2000.tb00710.x. ^ Garner, MM; Clubb SL, Mitchell MA, Brown L (2008). 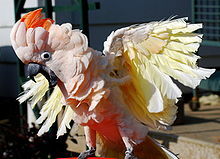 “Feather-picking psittacines: histopathology and species trends”. Veterinary Pathology 45 (3): 401-08. doi:10.1354/vp.45-3-401. http://www.vetpathology.org/cgi/content/full/45/3/401 2009年12月7日閲覧。. ^ a b Athan 1999, p. 86. ^ Athan 1999, p. 87. ^ Athan 1999, p. 92. ^ a b Brouwer, K; Jones M, King C, Schifter H (2000). 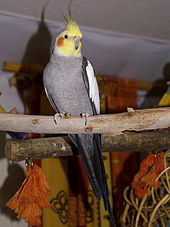 “Longevity records for Psittaciformes in captivity”. International Zoo Yearbook 37: 299-316. doi:10.1111/j.1748-1090.2000.tb00735.x. ^ Swift, W. Bradford (1997). “The healing touch - animal-assisted therapy”. Animals 16 (4): 130-32. ^ Elphick, Jonathan (2004). Birds: The Art of Ornithology. London: Natural History Museum. p. 24. ISBN 9781902686660. ^ Fraser, Hugh; Joyce, Ray (1989). The Federation House - Australia's Own Style. Willoughby, NSW: Weldon Publishing. p. 103. ISBN 1863020330. ^ King, A (2007). “Painting on a perch: parrots are an enduring theme in European art, as Averil King learned at an unusual exhibition at the Barber Institute”. Apollo Magazine. http://findarticles.com/p/articles/mi_m0PAL/is_542_165/ai_n27208348/?tag=content;col1 2009年12月12日閲覧。. ^ d'Harnoncourt, A (June 1978). “The Cubist Cockatoo: A Preliminary Exploration of Joseph Cornell's Homages to Juan Gris”. Philadelphia Museum of Art Bulletin 74 (321): 3-17. ISSN 00317314. ^ Rosenfeld, Arthur (1989). Exotic Pets. New York: en:Simon & Schuster. p. 105. ISBN 0671476548. ^ Boehrer, Bruce Thomas (2004). Parrot Culture: Our 2500-Year-Long Fascination with the World's Most Talkative Bird. University of Pennsylvania Press. p. 224. ISBN 9780812237931. Athan, Mattie Sue (1999). Guide to companion parrot behavior: with full-color photos and instructive line drawings. Woodbury, N.Y: Barron's Educational Series. ISBN 0-7641-0688-0. Christidis, Les; Boles, Walter (2008). Systematics and taxonomy of Australian birds. Collingwood, VIC, Australia: CSIRO Pub. ISBN 978-0-643-06511-6. Forshaw, Joseph Michael (2006). Parrots of the world: an identification guide. Princeton, N.J: Princeton University Press. ISBN 978-0-691-09251-5. Forshaw, Joseph Michael; Cooper, William T. (1978). Parrots of the world (2nd ed.). Melbourne: Lansdowne Editions. ISBN 978-0-7018-0690-3. Low, Rosemary (1999). The loving care of pet parrots. Saanichton, B.C: Hancock House. ISBN 978-0-88839-439-2.